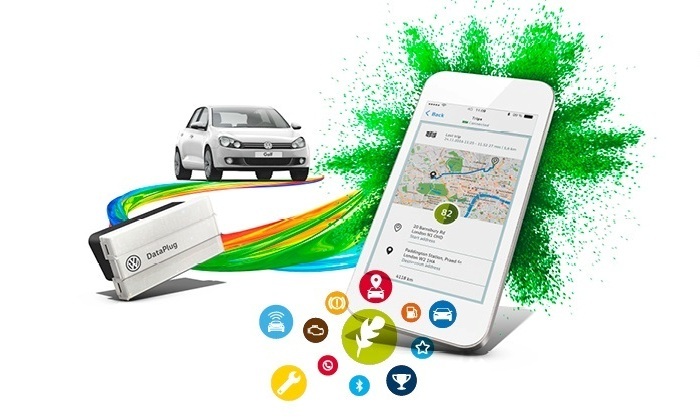 Volkswagen Connect App is the easy way to connect your Volkswagen to your smartphone. It relays everything you need to know, from service information and fuel consumption, parking location and top tips on driving more economically. The DataPlug is available for many Volkswagen models, built during 2008 onwards, to see if your Volkswagen is eligible, check here. To get your free DataPlug please ask your Service Advisor or Sales Specialist. The overiew of key information about your car such as service and maintenance intervals, warning message displays, fuel level and mileage. This feature shows detailed map views, trip details, statistics and the cost of each trip. This looks at all elements of the engine and braking performance, plus driving style to give you tips on how to be even more efficient. Everything you need to know about your fuel consumption and costs. It even tracks your fuel stops, especially useful if you're a business driver. Wherever you are, you can see exactly where your nearest Vollkswagen showroom is and be navigated there or call with a direct connection. Just press and call Volkswagen's 24-hour helpline and if you are not sure where you are it transmits your location. This feature helps you meet efficiency and driving style targets. Collect ponts and trophies and discover hidden tasks and bonus challenges. 1 Download the free Connect app in the Apple App Store or Google Play for Android. 2 Follow the setup instructions in the app. 3 Put your DataPlug in your car, in the diagnostics port below the steering wheel. 4 Connect via bluetooth and you are good to go.